The customer’s buying process touches many layers of their experience with your company. The product, solution, and price combine with your overall reputation and that of your people to form a gut level impression and drive a “Buy/Don’t Buy” decision in a way that transcends any rational analysis of each specific element. Fronting for the complete impression-making process is what I call a strategic message. – What markets do you serve? – Why are you, or could you be, a leader in those markets? – Why are you valuable to investors or acquirers? – How/Why are you a strategic success in the industry? We explored this topic in our section on finding your industry category and market-sizing. However, now, we are going to talk about how to express all of these different, interlocking ideas, in a concise outward-facing message. The figure below shows the elements of a strategic message. The elements needs to relate to one another. One thing to address right away are the differences between a strategic message and message used in marketing a specific product or service – a “go-to-market” (GTM) message. While these message types overlap, they focus on different aspects of your business and have quite distinct purposes. Strategic messages are high level and visionary, while GTMs are pragmatic and emphasize solutions and value propositions. Strategic messages advance the overall brand. GTMs advance the cause of the business unit/product/solution and business objectives (i.e. revenue/share). Strategic messages speak to industry level thinking. In contrast, GTMs focus on customer-centric thinking. Strategic messages are inclusive of all productions and solutions at a high level, but GTMs tend to stay on a single product set or solution. Strategic messages are often forward-looking versus GTMs that are usually directed at immediate action. Strategic messages drives awareness of the company as a player in the industry, not driving preference for a specific type of purchase. e.g. ExxonWe are the world’s largest publicly traded international oil and gas company, providing energy that helps underpin growing economies and improve living standards around the world. e.g. As the world’s leading synthetic motor oil, Mobil 1 helps provide total engine protection and excellent fuel economy. Comprehensible – Will the target audiences understand the message? Believable – Will the claims made in the message be believed, or will the company look ridiculous for posturing in an unbelievable way? Meaningful – Does the message mean something specific to the target audiences? i.e. If an analyst is reviewing competitors in a sector, will the strategic message create the desired impression? Aligned with go-to-market message – Does the strategic message further the goals of go-to-market message? The company innovates/leads/transforms the [market space] by producing [solution types] and leveraging [trends]. Apple Computer leads and transforms the personal digital device market by producing portable information technologies that leverage consumers’ increasing desire for ease of use. IBM is the corporate IT industry leader, with extensive technology offerings that leverage the trends of platform consolidation and reliable cloud computing. company’s mission and objectives for the message. A strategic message is like a spinning top. A lot of things can pull it down. As the figure shows, a successful message is like a top spinning perfectly. It gets positive reactions from key audiences without getting pulled off its axis by messaging problems. Being overly broad – This is a classic strategic message pitfall, where you want to go for broad appeal but sacrifice tangible value. For example, if you describe yourself as “an e-platform” or “a mobile lifestyle technology”, you’re not connecting yourself enough with reality to make much of an impact on people. Being overly narrow – To avoid being excessively broad and high-level, you might go too far in the opposite direction. Narrow messaging starts to look like a product based GTM. For example, if your strategic message says something like, “better thermal characteristics for semiconductors,” you’re probably narrowing it down too much. Category confusion – We’ve discussed this earlier in the book, but if you can settle yourself into a category you will land your message better than if you are off base or worse, creating a brand new category of your own. Being unclear – Vagueness is the curse of strategic messaging. Let’s say your company makes software testing tools but you want a higher level strategic message that connotes a broader value proposition. So, you come up with something like, “Powering reliability in the cloud.” The problem with that is you could be messaging hardware, operating system software, application software, testing software, or network infrastructure. You don’t want to be vague about what you actually do. Overreaching – We all do this from time to time but you have to watch out for overarching in strategic messages. Sometimes your enemy here is the gerund, as in “Transforming mobile technology.” Really? You’re going to transform a hugely broad, multi-billion dollar category? It’s too much, even if it’s a cool ambition to have. You don’t people to wonder what you’re smoking when you considered your potential. The funny thing, of course, is that some companies truly attain goals that would be considered overreaching. If Facebook had said early on that its goal was to revolutionize social interactions, that would have been laughable, but it would have been true. Strategic messaging isn’t easy. If it were, a lot more companies would have good strategic messages. This is not the case, to be polite. There are several major “gotchas” at work when you try to devise a strategic message that really lands where it’s targeted. For one thing, the more credible and comprehensible you get, the more potentially narrow and small you look. Then, there is problem of market evolution. I like to say, facetiously, that if you can explain exactly what you do, you’re too late. All kidding aside, though, if a technology category is well defined and understood, you have to work a lot harder to establish that you offer a unique value. Trying to be “hot” is a big pitfall. Technology that’s old and boring is not hot. It’s ice cold, and a big driver of low valuations and slim interest in your company. Mainframe tools, anyone? So, you want to be hot. Who wouldn’t? The problem is that if you want to establish yourself as being in a hot category, you may need to define a category that either doesn’t exist or is poorly understood. Or, to establish yourself in a new, hot category, you may need to make claims that you can’t back up, leading to possible credibility issues if the media wants to look into it. Consider, for example, how can you claim leadership in a category that either doesn’t exist or isn’t acknowledged by any respected third party? You will look as if you are full of hot air (or other more solid material that I won’t mention by name because my mother raised me right). Latching onto hot trends without any meaningful unique differentiators also makes you look like you’re desperately jumping onto the flavor of the month. Like, if you say, “We’re a cloud-based technology.” Guess what? Everything is a potential cloud based technology. Your message needs to outlast the latest craze. Another useful way to solve strategic messaging challenges is to think of your message in terms of comprehensibility versus credibility. As the chart shows, there is a continuum for message along both of these axes. There will be a sweet spot for your message in terms of its credibility and comprehensibility. In simple terms, you have four basic quadrants in which a message can land. At the top right, you have a clear and credible message. 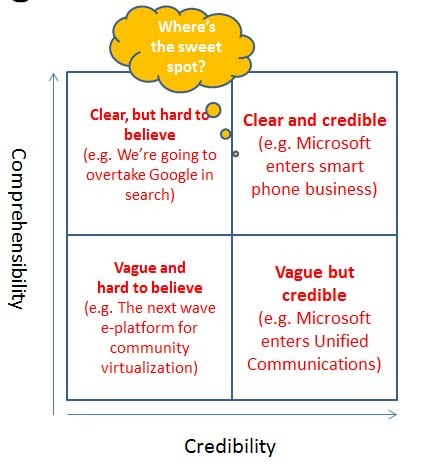 In this example, it’s “Microsoft enters the smart phone business.” Note, however, that there are two big pillars on which this clear, credible message stands: The category is well understood and the company has the inherent brand credibility to make the claim. If the message were, “RinkyDinkComm enters the smart phone business,” you would justifiably ask, “Who?” They lack credibility. Similarly, if the message were, “RinkyDinkComm, the leader in Cloud-Fusion Transactionality,” you might ask both “who?” and “what?”. Some messages are clear but hard to believe, such a company that announces it will overtake Google in search. I wish everyone the best of luck but that’s a mission I can’t believe in right now. Going around the chart further, we have vague but credible, which is when a known brand stakes a claim in a poorly understood category. For example, if you read “Microsoft, the leader in Cloud-Fusion Transactionality,” you would probably think, well I don’t have any idea what that is, but if Microsoft is doing it, it might be important. Certainly, there are no easy solutions for strategic messaging. It’s a subjective, messy process that involves a lot of trial and error. You will likely have to work at it for a while and iterate a great deal. Not everyone will be pleased with your strategic message, and in my experience trying to make all stakeholders happy is a sure-fire recipe for mediocrity. There’s a popular website and service called “Marketing Sherpa,” which offers specialized research for marketers. The name of the site, however, might describe how a lot of sales people view marketing in general. Oh, marketing? They’re our Sherpas. We’re climbing the Mt. Everest of sales – the real, hard work in this company – and marketing helps carry our luggage. Good for them! In every company, there is always a question of how marketing and sales should work with one another. Sometimes, it’s clear and marketing is the “Sherpa” for sales, assisting and facilitating but not leading. Other times, it’s more about marketing setting the vision and helping sales realize it. It can be balanced, too. In any event, there are certain duties that marketing has towards sales. In the dead horse flogging department, I’m not going to waste a lot of time discussing brand in a B2B technology marketing context. Yes, brand is important in this kind of niche marketing, but it’s not at anywhere near the level of significance that you will find in the consumer arena. The best way to think about brand as a sales support issue is to envision how you will deliver visual and verbal consistency to lend the company credibility and identity. A good brand for a business-facing technology company is one that connotes professionalism, quality and reliability. Opinions will differ on this point, but I have my reasons for believing this. As with so many other aspects of tech marketing, one absolutely must keep the customer clearly in view. For most technology products, the buyer is usually more conservative than your company management. I’m not talking red state-blue state here. I mean that technology buyers are typically risk averse and under pressure to deliver high levels of system availability. Your brand needs to communicate values that support these ideas. Please allow me a slight digression to make my point. When I was Social Software Evangelist at IBM, I was involved in product management and marketing for Lotus Connections social software for business. Lotus Connections presented an unusual branding challenge for IBM. Social software for business was something new, a cheeky kind of borrowing from consumer sites such as Facebook but striving for business legitimacy. The branding, which included the product interface itself as well as the web site and collaterals, was a great deal warmer and more “Web 2.0” looking that your average IBM business solution. That was intentional. Lotus Connections was trying to look the part. However, the branding was still very much identifiable as IBM, with all the gold-plated seriousness and honor that brand connotes. Some of our competitors, though, were not quite getting the idea. Forgive my exaggeration, but it seemed as if every company that was trying to enter the corporate social software space had a name like “MonkeyPoo” or “Crazanga.” These off-the-wall cruh-aaazy entrepreneurs who launched these brands were trying to show how hip and cutting edge they were. They thought this would impress corporate buyers. Wrong. The venture capitalists may have been infatuated with the latest and hippest but purchasing consideration is not helped by wackiness. Message(s) – Your message and brand are not necessarily the same thing, but they have to relate and be in alignment with one another. We’ll delve deeply into this a little later, but for now think about the alignment between your brand, your high-level corporate message and product-specific messages. Do you they fit together? They should, at least in terms of underlying value proposition. For example, if your corporate message is aspirational and creative, you will have a dissonant brand effect if your product-specific messaging tells the opposite story. For example, if you’re “Crazanga: We empower the collaborative mind” but your product message is, “Enterprise Collaboration Suite: Cost effective information worker team site deployment”, you’re going to have people scratching their heads. Logo, style guide and brand “system” – You need a distinctive look with a consistent use of fonts, colors and your logo. That’s branding 101. Why do I bother mentioning it? Here’s the problem that I have seen (and perpetrated, to be honest) at a number of technology companies. Most tech companies are founded with engineers who have little interest in marketing and even less money. Typically, they commission a logo and proceed to ignore basic branding style conventions for the next couple of years. This is totally normal and forgivable. After all, when you’re trying to build the product, the marketing is an afterthought. Then, when it’s time to go to market, you’ve got a messy brand on your hands. It is your responsibility to put a strong branding style guide into effect. This includes what is often called a “brand system,” which dictates how certain elements work together. For example, if your company has a signature theme, such as a blue swoosh, that swoosh should appear on your PowerPoint decks, Word documents, datasheets, website, and business cards. It’s your distinctive brand element. - Technical notes or “Solution Briefs” – These are short documents that go into greater depth than the datasheet and can also cover topics that are related to the main product details contained in the datasheet. For example, Kwikapp might have one datasheet for its basic photo portal. Supporting technical notes could delve how the product works, underlying systems that it uses, how it connects with other applications, how it serves specific industry verticals, and so forth. - Technical white papers – A technical white paper goes into real depth on how a product or solution works. They are intended to assuage the curiosity and potential objections of serious technical members of the buying committee. - Case studies – Buyers like to see that people in similar occupations have had a successful experience with your product or solution. A case study needs to demonstrate that your product solved a distinct business problem. Increasingly, case studies are being presented in both written and video form. As the marketing person, part of your job is to create sales presentations in PowerPoint (or equivalent non-Microsoft digital files, for my IBM friends out there.) Using your branded PowerPoint template, you need to collaborate with sales to devise an effective presentation that matches your overall messaging and value proposition. Some marketing people do not consider this to be their responsibility, and they are half right. Yes, sales people are always going to adapt and customize the decks you prepare for them. That’s good and bad. It’s good because there are constant changes in the sales pitch and the presentation will vary from prospect to prospect. The bad part is that sales people can, with the best of intentions, come up with new marketing concepts on the fly. In my experience, this is not a good situation. You will already have enough trouble wrangling all your marketing content without sales people acting as gratuitous freelancers. Key product facts, i.e. what’s new about it, cool features, etc. Basically, a battle card should have everything a sales person needs to conduct a five minute sales call and get from low awareness to consideration in a potential deal. Marketing is responsible for creating the battle cards. However, making a great battle card involves a skill that some marketers need to improve: Listening. The sales people are really the authors of the battle cards. They are the ones out in the field talking to clients and prospects every day. They have the knowledge that will go into the battle card. If you don’t listen to what sales has to say, you will create a sub-standard battle card. Your role, though, is to listen and interpret what you hear about discussions in the field and translate them into those hard-hitting, brief attack points that will push the deal into the pipeline. And, of course, you need to align the battle card with other elements of your branding and go-to-market programs. The sales process for enterprise technology invariably involves the development and submission of a written proposal. This can be as simple as a price quote or as elaborate as a massive, multi-media document. I have personally been involved in crafting proposals that are longer than this blook. Yikes! Very often, the culprit is a “Request for Proposal” or RFP. These are also known as request for information (RFI) or request for quote (RFQ). No matter what they are called, however, the RFP is a list of questions posed by the customer that the vendor needs to answer in written form. Like so many tasks in sales and marketing, different people have different ideas about the right way to do a proposal. Some suggest a very short form with minimal text accompanying the RFP answers. Others even go to the extreme of simply returning the RFP questionnaires (Typically in Excel) format with absolutely no explanatory text. In this case, though, I must insist that you listen only to me. Seriously, I have worked on proposals now for fifteen years and I have a very good track record of success. I have written proposals that have resulted in millions of dollars of revenue from Fortune 1000 clients. My recommendation is that you develop a proposal template that the sales team can re-use and adapt for multiple sales engagements. The template will be a Word document (or something like it) that the sales person can easily customize for each RFP response. Title page, including the client’s logo. Table of contents – very important to enable quick navigation of a large document. Introduction – one page max giving an overview of the client’s needs and your solution recommendation. Executive summary – one page max giving a thumbnail of each section of the proposal. Our Understanding – recapping of client’s requirements in your words to show that you understand what they need and that get where they are coming from, in a business sense. Our Recommendation – this is where you can paste in the answers to the RFP questions. However, this section needs a wrapper that sets up your proposal solution as the one to be selected and explain why. Solution approach – this may or may not be addressed in the “Our Recommendation” section. This can go into greater depth about your solution than you can in the simple RFP answers, which are often a few sentences long and aimed at answers very specific technical questions from the client. Project Plan – explain how you intend to implement the solution, including timelines and personnel to be utilized. You may want to add resumes of key project implementers. Pricing – breaks out what you what plan to charge. Sales people, those mythic he-men (and she-women, if there is such a thing) believe that business is a war and that they are the front line troops. This notion has some symbolic truth, though anyone who has been through an actual war might find the analogy a bit insulting. Still, those front line solders need “air cover” from you to protect as they battle competitors. Like those brave Marines who mounted Mt Suribachi on Iwo Jima, who needed strafing from P-51s to keep the enemy at bay, your sales people need all kinds of marketing content to stave off flame-thrower wielding competitors. Every piece of content that your salespeople can show to their prospects is like a 50 caliber round exploding near the foxholes of your competitors. It keeps them from hurting you. All of this accrues to the main goal of air cover, which is the sales person’s ability to say, “We know what we are doing. People respect us. And, we’re prepared and professional enough to have all these materials to show you.” As you might intuit, air cover has a lot to do with answering a set of questions that may not have been asked, namely: “Why should we consider your product?”, “Has anyone actually used it, or are we your Guinea Pig?”. This is not a phenomenon restricted to startups, either. Established vendors also face credibility challenges when they are introducing something new. Even if you are carrying a bag for a multibillion dollar IT behemoth, if your product is unknown or unproven, you’re going to need air cover. What’s the difference, you might be wondering, between a marketing white paper and a technical white paper? Glad you asked. A technical white paper, which we discussed above, goes into depth on a technical topic, explaining numerous details of the subject that would be of interest to a technical decision maker. A technical white paper is intended to provide enough clarification on a technical topic to convince a technical decision maker to consider or prefer your product. In contrast, a marketing white paper is aimed at a business decision maker and presents the product in a broader business context. It is intended to answer the higher level question, “why is this product right for my business” the two paper types almost always overlap. We’ve talked about lead generation previously in this blook so I won’t beat it to death here. What’s worth pointing out here, though, is that lead generation should be seen as part of a bigger sales support function that marketing performs. All the sales support elements come together when you do lead generation. Whatever the lead generation program is – a trade show, email campaign, webinar – once the lead is on the hook, you need to be able to deliver a complete sales support package to help the sales team push that lead all the way over the finish line. Marketing is part of every company’s strategic mix. The direction that a company decodes to head in should be based on an understanding of the market and trends that affect the business. As a marketer, you should have a voice in the strategic decision making process. Then, in the implementation of the strategy, you need to be able to advise senior managers on the structure of the marketing organization itself. Unless you are a marketing bigshot in a large company, however, you may view the idea of advising senior leadership on strategy and the marketing organization as being a bit above your pay grade. You may have more of a voice than you realize, though. When your managers, the VPs of marketing and CMOs, need to advise their bosses, the CEOs and COOs, they may turn to you for comment. (If they are smart they will.) Plus, if you plan on moving up, you should learn to think about the bigger strategic and organizational picture. In a small company environment, you should definitely have a point of view on strategy and the marketing organization. In the intimate executive suite of a startup, for example, there can be many direct discussions about strategy and organizational shape amongst senior operational, marketing, engineering, finance, sales managers. If you speak for marketing, you need to have at least one cent (or maybe two cents) on the topic. Even defining “strategy” as it relates to marketing can be a bit challenging. Strategy is one of those words that gets used, misused, misunderstood, and overused. It’s a word that can be used to inspire discussions, hurled as a threat or a catch-all “shut up” switch. Invoking strategy is a great way to purport to take a discussion to a higher level, thus leaving lower level thinkers out of the mix. It’s helpful, in that context, to think about strategy in terms of two broad constructs: High level corporate strategy, and marketing related strategy. Marketing gets involved in strategy, however, when the discussion gets to competition, alliances and partnerships. While some technology products are successful on a standalone basis, most require an alliance of some sort to get into the market. For example, your product might be an add-on for Microsoft Exchange Server. In that case, your alliance strategy is extremely clear. You are part of the Microsoft ecosystem. The Microsoft channel is potentially your channel. Their release cycle affects your release cycle, and so on. A broader example might be a decision to make your product compatible with the Linux operating system. In this case, you are allying yourself with the Linux community, and perhaps some Linux vendors, such as RedHat. This is partly a matter of technology strategy, of course. However, the way your company builds products to fit within alliances and channel partnerships is also very much a marketing matter. Understanding strategy involves seeing where your product fits into an ever shifting ecosystem of technologies, products, vendors, partners and trends. Where are you today? Where do you want to be in a year? It’s not a discussion that occurs in a vacuum. Your competitors are constantly innovating and devising new ways of expanding their market share – putting you out of business, in effect. How will you react? Though they are surely gag-inducing, I am going to use the terms “holistic” and “high level” to describe how you can best assess your strategic options. Gag, because these terms are overused. But, hate them as you might, they are indeed the most apt way to get at effective strategic thinking. The subtext of this thought is that strategic discussions about competitors, alliances and partners are prone to devolving into engineering resource allocation arguments and sales-driven chest beating about what features the company needs to win deals now. Similarly, strategic discussions of partnership can go into rat holes about what partner is the easiest to get, the partner most aggressively courting you, and so forth. As a marketer, you are in a position to offer a more holistic and high level view of what is going on and how the company needs to plot its course. You also have to be customer-centric. The figure below summarizes how I would approach a strategy discussion. 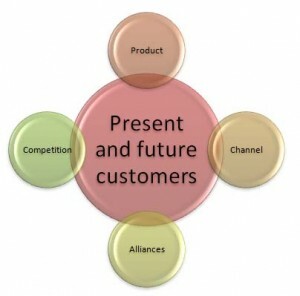 The customer is at the center. But, you need to include future customers along with existing ones. 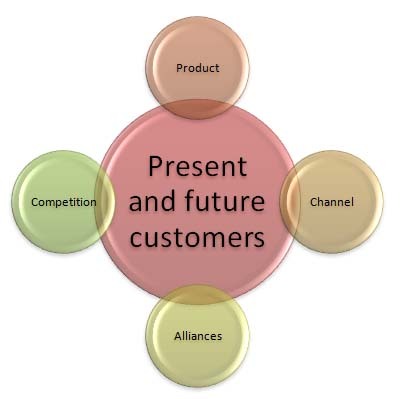 From there, every discussion about the product, channel, or alliance strategy, as well as competition, should relate back to how these present and future customers will react? So, imagine you’re sitting at the executive staff meeting reviewing Kwikapp’s strategic options. Each option will have an impact on customers, alliances, channel, and product. There are three options on the table, each of which has specific ramifications for the market that Kwikapp is in. The chart below summarizes how you can think about these interdependent issues. This example of course goes with my standard disclaimer that this is a completely hypothetical and should not be taken as a true reflection of any particular technology in the real world. Let’s assume the following current situation: Kwikapp is a Java-based application that is currently supported on the Apache application server running on Linux. Integrate with SharePoint Surface the Kwikapp functionality as a SharePoint Web Part No impact on present customers. Will be attractive to customers that are standardizing on SharePoint for their intranet portals. Brings us into competition with various SharePoint-based content management systems, as well as SharePoint itself. However, SharePoint integration makes us appealing to Microsoft shops compared to incompatible competitors. The SharePoint technology partner ecosystem is large, but we are not connected to it at all right now. To get included in solutions being developed for SharePoint, we will have to invest in making ourselves a known quantity in this area. We face an obstacle as a non-Microsoft technology – this will have to be overcome through messaging and case studies. Similarly, there is a huge channel for SharePoint, but we are new to it and will have to work hard on building relationships. Product is not currently designed for SharePoint compatibility. We will have to invest in development and continued support of this alternative technology. Be “platform agnostic” Support any application server or database, including Windows Server, though not integrating with SharePoint per se. Very appealing for new clients who are on different app servers. Being able to say “Yes” to virtually any server scenario puts us in a strong position competitively. We fit into a number of alliance groupings with this approach, including the J2EE community, the WebSphere community, the Solaris and Linux communities, etc. From the database perspective, we fit into the oracle, MySQL and MS SQL alliance groupings. We can work closely with IBM WebSphere though we need to be a proven reseller of their server licenses to get much support from them. Being platform agnostic can mean having serious support challenges, with each customer potentially having a different support scenario – e.g. Solaris 10 and Oracle 11 vs WebSphere 6.5 and DB2. So, as you can see, strategic choices can be messy. There are few easy answers, despite the insistence from some that this or that move is a “no brainer.” In my experience, the phrase “no brainer” usually indicates a lack of brains on the speaker, who has not delved into the issue enough to understand the complexities involved. That said, someone, at some point, needs to make a strategic decision. Okay, are you done now? No, you still have a couple of big hairy “gotchas” to inject into the discussion. If you go for the platform agnostic strategy and perhaps the SharePoint integration strategy as well, you face two potential marketing challenges: You may have service breakdowns as you struggle to support so many different technologies. If the customer experience suffers, that will affect your brand image negatively – a problem that can be hard to correct once it is established as a public fact. On another front, you will almost surely have a slower pace of innovation and release with such a broad strategy than you would have with a more focused approach to software development. If you have to test every new release on multiple stacks, with myriad database, app server and operating system combinations, not only will you be slow, you will invariably miss some bugs and release defective code. It’s a just a reality of the business. Again, your image could suffer. Faster rivals could capitalize on these weaknesses and overtake you. I’m going off the marketing reservation a little bit here and discussing how I personally view the differences between partnerships, alliances and channel relationships. This discussion may not reflect the mainstream views of the profession, but the truth is there is not much agreement on what these terms mean. At a high level, of course, any business relationship between two companies in the technology industry could accurately be referred to as a “partnership,” but this generality does us no favors when we try to figure out what’s really going help our strategy. While there is indeed overlap between the concepts of a partner and a channel partner, for example, they are distinctly different relationships. So, feel free to take the following with a little pinch of salt. In the technology industry, a partnership occurs when two or more businesses join forces to market their products to a common set of customers. There are myriad possible combinations, but the three most common are the System Integrator (SI), Independent Software Vendor (ISV) and Original Equipment Manufacturer (OEM) approaches. System Integrator – An SI is in the business of building complete information systems for its clients. Like a contractor building a building, the SI will incorporate a variety of technology products into the system it is creating. From a strategic perspective, SI partners can be a helpful way of extending your reach across a far broader market than you can likely access on your own. This is the case for several reasons. For one thing, the SI usually has deep, trust-based relationships with clients you probably haven’t met, and even if you did, they wouldn’t know you at all. The client prefers to buy from the SI. The SI also usually implements technology in addition to selling it. In most cases the client wants to purchase a complete solution, and will rely on the SI to deliver it. However, like all potentially great strategic options, SI partners have their good and bad qualities. Ideally, the SI will walk your product into endless new accounts. However, most SIs need a fair amount of training and prodding to do that. The good and big SIs are also often overloaded with vendors trying to get them to build their products into solutions, so it’s easy to get lost. Then, if the SI has problems with your technology or needs excessive support, your own resources can get stretched thin very quickly. ISV – And Independent Software Vendor has typically created an application that contains other applications. For example, many business applications require a database. The creators of those applications may be ISV partners of a major database company, such as Microsoft. Thus, if you buy the application, you will also be buying a license for Microsoft SQL Server. From Microsoft’s perspective, the ISV is a conduit for sales revenue because each license of the vendor’s product “pulls” licenses for SQL Server. OEM – An Original Equipment Manufacturer (OEM) is, as its name suggests, a concept borrowed from manufacturing industries. An OEM is sort of the reverse of an ISV. An OEM is a company that supplies parts that are built into a product that someone else sells. Think Bendix Springs. Bendix made the springs, but Ford, GM and other sold the cars that carried them. Bendix was an OEM for Ford and GM. PCs are full of OEM parts. The outside case may say Dell but the innards come from Panasonic, Intel, and many others. In software, it’s no different, though things can get a little more abstract. May software solutions contain elements from other software developers. For example, you might sell an accounting system that ships with Windows Server and Microsoft SQL Server. In that case, Microsoft is an OEM for your product. Software OEMs are common in middleware scenarios. For example, some platforms come with OEM-created adapters that connect them to mainframes. Finding a good OEM relationship can be a great boon to your sales efforts. If you are leveraging the sales volume of a big partner, their business will pull your along. OEM business comes with its own pain, of course. Your margins will likely be lower than if you were selling direct and support and maintenance issues can be a challenge. I define an alliance as agreement between companies or comparable entities – perhaps informal – to use one another’s technologies symbiotically. This may not match everyone’s definition of an alliance, but I hope my approach to the concept will provide a useful framework for thinking about the issues involved. In most cases, an alliance is between a small company and a much larger one, or with a large and influential community/organization. For example, a software developer could be allied with Microsoft in both formal and informal terms. The company might be a Gold Partner of the Microsoft Partner Program, formalizing the relationship in the alliance. Informally, and perhaps even more important, the software developer is a “Microsoft shop” and deals with clients that also tend to be “Microsoft shops.” Similarly, there are alliances in broader community categories, such as those surrounding the Linux operating system, Java and so forth. From a strategic perspective, alliances can be defining and essential in both positive and negative directions. Alliances tend to be exclusive, mostly due to the technological challenges of mastering one specific stack. Some tech industry industries can be platform agnostic, but it’s pretty rare. Generally, you’re in one alliance or another, even if you don’t plan to be. The good part of an alliance is that it opens your business to numerous opportunities to sell within the alliance. A J2EE application server “shop” will be a potential client if your product runs on a J2EE server. Alliances provide opportunities for M&A, recruiting, and networking opportunities. That said, alliance can limit your potential. One example of this, which I bring up at the risk of bodily injury, is the IBM Lotus Domino alliance. With absolutely no intention of offending anyone who loves Domino (And people love it, for sure), it is a fairly limited software ecosystem. Certain companies are committed to it. Others have embraced other technologies and will likely never consider Domino related products in the future. A Value Added Reseller, or VAR – Sells your products as part of a solution they are building for someone. The concept of a VAR overlaps with that of System Integrators. Often they are the same company. A Value Added Distributor, or VAD – Sells your product as part of a large catalogue. A VAD typically sells many products and serves as a important sales channel for major licensing deals. For example, companies such as Microsoft and Oracle sell much of their product through VADs, even in cases where the end customer is buying millions of dollars with of software. The VAD processes the order, manages the “paper” of the cash transaction, and connects with the software vendor for management of license IDs and so forth. Many partnerships in the technology industry blend the SI/VAR/OEM/ISV definitions. Some companies only play one role but most of the time the SIs are reselling technology from others and profiting from it, VARs are doing SI work, and so forth. It all runs together. From a strategy perspective, the main takeaway is that a technology company almost never succeeds all by itself. It’s inevitable that your company is going to need to find partners. Or, you may have to assess how your current partnerships are doing and make changes. And of course, you always have to be strategizing about how to best take advantage of your partner relationships to move your business objectives forward. This is where marketing gets involved in the execution of strategy. Product management is a process that ideally blends long and short term planning. There’s always what is happening right now, but if you’re doing your job correctly, you should have your eye on the future. Most product managers create a “product roadmap” to express how everyone believes the product should evolve over the next, say, five years. The chart is a rough approximation of a roadmap. At each interval, perhaps a year, a major new platform integration is planned. The roadmap exists for several purposes. For one thing, it’s about having agreement – or the appearance of agreement – on where the product is going. The roadmap is also a concession to the reality that most teams can only do one major update at a time. It’s often wishful thinking, anyway. Nobody really knows where the market is going to be in five years, or what new technologies will be affecting product management decisions. Sales is a major stakeholder in the roadmap. In most large scale technology sales, there are client requirements that simply cannot be addressed by the current state of the product. No single product can satisfy every demand made by an enterprise. As a result, sales people want to show their clients and prospects a product roadmap that demonstrates that you have a commitment to making the changes in the product that the client wants. Should You Do Market Research? I have to disclose that my wife is a professional market researcher and focus group moderator, so even asking this question is heresy. In some industries, serious market research is de rigueur. For example, in my wife’s case of medical and pharmaceutical marketing, research is a fundamental of the process. Few major marketing decisions are made in that industry without structured research and deep analysis. But, having worked in technology for a while, I have some insight into which situations demand rigorous market research and which do not. It’s worth digressing for a moment into the different forms of market research so we can all be on the same page. We all know what market research is, right? Yet, when we really try to define it, the clarity we may have had starts to fall apart. At least, it does for me. As a result, I thought I would start this section of the blook with a little overview of market research. If your brain is perfect, unlike mine, you can skip ahead. Market research, broadly speaking, is any activity you undertake to achieve a better understanding of the market, competitors and customer. There is a spectrum of possible approaches to market research, some of which are better than others for a given objective. Market research is yet another area, however, where the B2B tech industry is different from consumer-facing industries or other more conventional business marketing endeavors. The culprit, as always, is the shape-shifting categories that we find ourselves in. What market are you in? It’s such a basic question but one that is hard to answer accurately much of the time if you market technology in the B2B context. If you don’t know what market you’re in, how can you research it? You can, of course, but some of the traditional approaches to research don’t hold up very well. You have two broad choices when it comes to market research. You can buy published research or do your own. Doing your own may or may not involve engaging a specialized agency. Published research, which includes industry reports and assessments of new technologies, and so forth, can be helpful, but also prone to error. The tech industry is constantly in flux and categories are hard to pin down. In that context, you can form wildly wrong conclusions from reading a published report. I have seen so many examples of estimates of industry size or dynamics that simply don’t match reality. For example, if you were looking at the mobile phone industry in 2005, Apple wasn’t even on the map. A few years later, it was the map. Doing your own research is generally a better, if more costly idea. You can form your own hypothesis to test and figure out what you want to learn for your specific situation. That said, it is also easy to fall into many different types of thinking traps when you do your own research. We are all victim to our own views and experiences, so you can the risk of designing a research project that confirms whatever erroneous view you already hold. Quantitative – In quantitative market research, subjects are typically asked a narrowly focused range of questions on the research topic, with multiple choice, yes/no, or “scale 1-5” type of questions. The answers can be tabulated as uniform data and presented as statistically relevant findings if the sample size is large enough. For example, when Trident says “4 out of 5 dentists who chew gum recommend sugarless gum…” that is a statistically meaningful statement (we hope) based on a market research survey. To get to that finding, Trident had to interview some large number of dentists – a large enough sample to make the claim valid. If they interviewed 5 dentists and got 4 to say they preferred sugarless gum, that won’t work. Examples of quantitative market research execution include phone surveys, “mall intercept” interviews, and online surveys. In most cases, quantitative interview subjects are not paid for their time. Individual Interview – Also known as an in-depth interview (IDI), this technique provides the deepest level of potential insight into the customer though the least statistical relevance. It’s just one person’s opinion. However, if a researcher talks to 20 individuals in depth and finds that each person has a similar point of view on an issue, that’s a significant finding. IDIs can take an hour or more. In most cases, interview subjects are paid for their time. Group Interview (Focus Group) – This is a better known qualitative research technique wherein a group of subjects are gathered into a discussion room that usually features a two way mirror so clients and agency personnel can observe the proceedings. In a focus group, a moderator takes the group through a series of open-ended questions, facilitates discussion amongst the members and probes for more information when a discussion is trending in a direction that fits the research objectives. Focus groups can yield valuable insights into how people interact with one another to form opinions on a marketing topic. The group often encourages people to talk more, though unfortunately groups can get hijacked by domineering personalities. For this reasons, almost every focus group project requires a minimum of two groups. In most cases, focus group subjects are paid for their time. In both the IDI and focus group examples, the researcher prepares a report on findings from the research. The raw results can be revealing, but as the marketer, you probably want someone to summarize and synthesize the findings. Informal market research is similar to formal but it is homemade, essentially. Examples of informal research include customer focus groups and user group discussions. It is also relatively simple and inexpensive to put together a survey online and blast it out to your email list. Here’s what’s right about informal market research: It’s cheap. Don’t underestimate the value of that aspect. It’s intimate and shows your customers that you are listening. It’s direct. It’s a dialogue between your company and its key stakeholders. It can be a lot faster than formal research. The formal market research process can be lengthy, perhaps by necessity. To clarify objectives and produce an effective interview guide, recruit candidates, interview them, and then process the raw data, you’re looking at a minimum of 2-4 months. Informal work can be executed more quickly. That, however, is also one of its major drawbacks. The immediacy and rapid pace of informal research can be as much of a problem as it is a blessing. Talking with your customers about your products and future plans has several major drawbacks. It’s not a blind study – People tend to be a lot more honest when they don’t know who they are talking to, or about, in a market research study. If you are speaking directly with someone who has already bought your product, you are not going to get the kind of deep findings you need about why they chose you over a competitor. There is a relationship already in existence that will influence the discussion no matter how hard you try to obscure it. They may not want to hurt your feelings, or insult the engineers who made the product. Or, they may be mad at you and express a lot of negativity that doesn’t reflect the product reality either. You can get hung up on specific irritants – So many client focus groups devolve into of “You said you would add this feature a year ago. Why have you not done so?” The subject’s frustration with whatever the issue may be – customer support, performance, etc. – will trump any productive research discussion. You get myopic yourself - The best research opens up the thought process and discovers findings that one may not have thought of previously. You run a huge risk in a client focus group of concentrating only on topics that are relevant to the customers and to your development team. This may make short term business sense, but you’re missing a lot of potential findings by not asking broader, more open-ended questions. For example, imagine you have a Java application that runs on Tomcat server. Your biggest customer is hung up on wanting your app to run on Solaris. You therefore ask your client focus group how much they want the app to run on Solaris. What you don’t ask them, but which they might tell you if you knew how to probe with open ended questions, is that they actually want the app to run on Windows Server. It takes a lot of work – Good market research takes a lot of work. Chances are, you don’t have the resources to do it properly yourself on a regular basis. Some companies set up a customer council and have a great first meeting. Then, six months later, at the second meeting, the marketing team is not prepared for the discussion. They don’t have the bandwidth to do the intensive work of establishing research objectives, creating a discussion guide, and so forth. The second meeting falls flat. The third meeting is an embarrassment. The fourth gets postponed. The group never meets again. Your customers think you’re flakes and you’ve learned little. You are going to want to talk to your sales team and get their input on the market, what customers want, and the kind of features that should be added to the product. It’s absolutely essential. After all, the sales people are right out there in front of the clients, facing off against competitors. They know what sells. But, be careful. Sales can get hung up on what they need to sell something right now, not what the wisest long term product strategy might be. Sales people can also be very persuasive (that’s their job, isn’t it?) to get you to buy into their view of what the product needs. It’s necessary to filter input from sales to remain focused on what’s best for the product in the long haul. Competitive analysis is another necessary but tricky aspect of doing informal market research. You have to do it. You would be derelict in your duties as a marketing professional if you didn’t. Yet, you have to face the limits of competitive research. On one level, unless you are going to buy your competitors’ products and tear them apart – something that most big companies do – your insights into the competitor offerings will be fairly limited. You can try to get customers to give you their opinions on your competitors, but many people feel uncomfortable doing so. It will depend on your relationship. The best competitive insights often come, unfortunately, when you lose a sale to a competitor. If you can figure out why you lost, that will tell you a lot. Otherwise, you are stuck with analyzing the public record, which is not always useful. You will find your competitors product feature claims online, but you won’t know how well they work. You may see list pricing, but you won’t see how they really charge. Analysts can be helpful, but even these folks can be influenced to think one way or another – and they are often wrong. The bigger picture about competitive analysis, and all of these research techniques, is that they tend to trap you in what is already happening and limit your thinking about the market and product to what is currently in favor. Anyone doing market research should reflect on the fact that Steve Jobs, arguably the most successful technology entrepreneur ever, did not believe in market research. As Jobs famously said, it wasn’t the customers’ job to tell him what they wanted. Sometimes, true free thinking is the best market research. Not all of us (or any of us) can claim the technology marketing genius of Steve Jobs. But, we can take a cue from him and try to be circumspect about market research. Research will definitely tell you important things to understand about the customer and the market, assuming you are ready to listen. It can also lead you astray. The best practice is to try to take it all in – formal research, informal research, purchased research – and blend it with your own thoughts, your own gut instinct about what is really going on in the market. If you’ve been working in a particular sector for a while, you are going to have your own ideas about what is going to work in the market and what isn’t. The trick is to trust your gut but allow yourself to see critical findings in the research process. You may conclude ultimately that you are wrong, but don’t sell yourself short, either. Partner with engineering. I know, barf! Don’t you hate those MBA terms like “partner with engineering”? I do, in general, but in this case, it’s actually a good idea in this case. Like it or not, you are going to have to work closely with engineering to get your views on the product heard and your ideas implemented. It’s a relationship, too. Though engineering and marketing are on opposite sides of a tech business typically, it doesn’t have to be that way. For the relationship and working partnership to be successful, you need to take the initiative to overcome a few major obstacles. I am guilty myself of not being totally diligent on this front as I need to be, but I remain committed to the idea. Take the time to understand the product from an engineering perspective – While you may not ever truly get the product at the code object level, you need to understand how the product works under the surface. This will help you assess possible changes to the product in terms of difficulty and expense. A lot of product ideas may seem cool, but when you evaluate them in the context of effort required to implement, you may see them different. For example, it might seem appealing to adapt your product to integrate with a mainframe. However, you have to be sure that there really is a market for that integration before you set out on what can be a pretty costly and complex process. Get to know your engineering counterparts – This sounds simple bit it’s often overlooked. Engineers are people, too. Get to know them. Having a personal connection will help you both as a listener and as an advocate of marketing’s perspective on the product roadmap. Respect that engineering has its own plans and goals – You may have a sudden inspiration that seems like a no brainer. Yes! We need a WebSphere portlet! Can you make it tomorrow? Uh…. No. The engineering team is usually hard at work adhering to a plan that was set out for them before you got involved. Asking them to drop everything may not be a wise call. Going over their heads and getting a high level dictum requiring them to drop everything for your sudden inspiration or self-propelled change in product strategy is not going to make you any friends either. Earn your credibility – A lot of engineers look at marketing as merely the people who make things look pretty. In some cases, that’s true. However, not all tech marketers are superficial. You probably won’t rise to the level of engineering knowledge that they have, but you can be a quick study and show that you understand the engineering process. For example, if your engineering team uses an agile software development methodology, you should try to get your head around how that process works. You should have an appreciation for the develop-test-release process, and so forth. Understand that good engineering takes time and talented people. Some technology marketers are involved in product design, but not all. The term that gets used most to describe marketers who contribute to product design is “Product Marketing.” Sometimes, the phrase “Product Management” refers to this function, though product management is more typically a role that involves basic marketing on behalf of a specific product. I mention this because marketing people need to be involved in product design but their input is not always welcome. Titles can suggest a responsibility for product design input. In my experience, marketing’s involvement in product development will be greeted with reactions that range from, “go @#$% yourself” to “Thank you for sharing. We’ll get back to you.” Sometimes there’s real cooperation. For marketing to have a seat at the product development table, there usually has to be some executive level support for the idea. Otherwise, it’s prone to failure. Your role in product development will also depend on the size of the company and marketing organization. In some cases, there is a specific product marketing function that has a distinct responsibility for researching customer needs and collaborating with engineers on product design. Most of the time, though, the connection is a bit more tenuous. But, marketing absolutely should be involved in product development. One reason is that marketing’s own success or failure will depend, to a great extent, on the product itself. A lot of fired marketing executives were guilty only of being forced to market a product that the market did not want. First, let’s get an overview of how it’s supposed to work. There are myriad variations on the pattern, but the cycle shown in the figure below summarizes most approaches to product marketing. At the beginning, the product marketer tries to figure out what customers need and what the market will reward – not necessarily the same thing, as we sometimes see. This stage is known as “requirements gathering.” Gathering requirements can involve market research, discussions with clients and prospects, competitor analysis, as well as analysis of deals that were lost. Sometimes this last one is the most important but is often neglected for psychological reasons. The MRD is a consensus piece, essentially. It can be long or short – I’ve seen them range from four pages to fifty. The way it’s put together depends on the way your organization blends marketing and product development. The main goal is to use the MRD as marketing’s input into the development process. 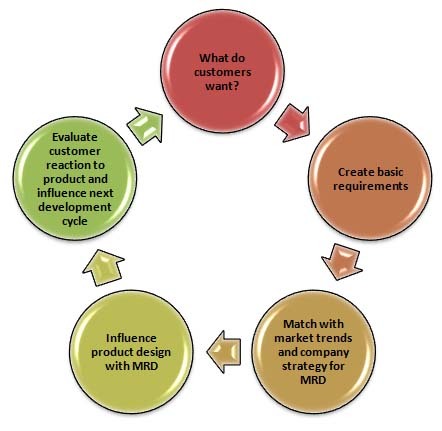 MRD and marketing input follows a cycle, shown below. 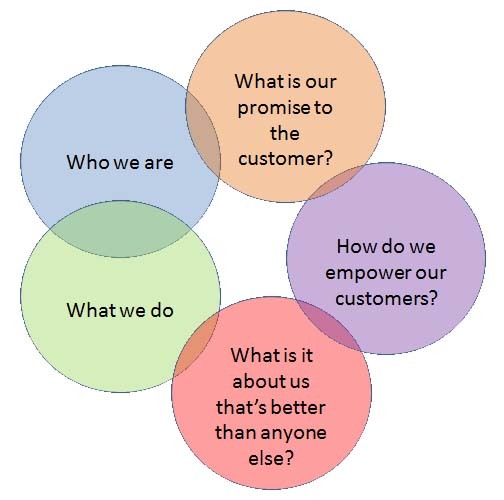 The first step is determining what customers want (duh!) through some kind of research. Then, after the list of basic requirements has been generated, you need to mesh them with relevant facts on the ground, such as company strategy, how the product is engineered, and so forth. For example, if your research indicates that your clients desperately want Adobe Flash video in a product built to support Windows Media, that is a factor that will need to be addressed in engineering. It’s not a show stopper, but it does complicate matters. As the product development process continues, the MRD can be a touchstone for engineering and management to come together and agree on what features will be included in upcoming releases of the product. The engineering twin of the MRD is the product-requirements document or PRD. Sometimes, it’s all the same document. Now that we know a bit about the customer, we need to understand that there is no customer in enterprise technology marketing. What? That’s right, there really is no customer. There is only a committee of people who evaluate and purchase products. If you need to think of a “customer,” imagine a hydra-headed creature that combines all the elements shown in the table below. Your customer is a composite of multiple points of view held by the group of people that influence the purchase decision. The chart below attempts to organize the composite by plotting each individual’s functional role and their purchase influence on two axes. Big as it is, it is nonetheless a simplistic representation of the personas involved in an enterprise technology sale. On the X axis, we have the three levels of influence. On the Y axis, we list the stakeholder roles. Roughly, these roles break into business and IT. Stakeholder roles include basics such as “Individual User” and “LOB Manager,” but also “Group.” Who is “Group?” There is not anyone named “group” at most companies. What I want you to understand is that the group that uses the product is itself a stakeholder, even if there is no specific individual stakeholder you can speak to about the group’s needs and wants. Good LOB managers will consider the overall group’s perspective on a technology before they recommend purchasing it. Kwikapp wants to understand who the “customer” is when it sells its photo portal to a marketing department. Understanding the customer(s) in this situation will drive sales and sales support work streams (e.g. collaterals, how to craft the proposal, how to demo the software, etc.) Filling out the chart shown above, they can assign end user/influencer/decision maker status to each of the buyer personas they are dealing with in the sales process. Here’s how it shakes out: This is not an IT critical sale, such as a firewall or server, so IT in this case is an influencer, but not a decision maker. IT will have to endorse the final selection, and they must be treated with great care. However, the purchase order will be signed by the VP of marketing. It will come out of her budget. The chart will look different depending on the customer situation. The challenge is to see the path to building preference according to the lineup of influencers and decision makers. It’s not that complicated an idea – you need to figure out what each buyer persona needs and communicate that you deliver it. What’s their pain? You solve it. The challenge comes in trying to understand and address so many different points of view. LOB Executive VP of Marketing Wants faster execution of projects More product teams from use of portal. Operations Support desk personnel Tired of fielding the same question about how to download an image over and over. Browser-based portal, hosted on standard server, is easier to support. Security Images are information assets that need to be secured, but most repositories make it hard to do. Security settings feature enables security management for asset repository. IT Manager Director of IT for Marketing Adding systems means adding support budget, which is not possible. This portal enables consolidation of image repositories, resulting in fewer systems to maintain. Of all these personas, some will inevitably count more than others. You seldom see a situation where everyone’s voice is equal in driving preference and selection. Who really matters in this configuration? The trick is to target who has the greatest pain and who has the greatest influence over the purchase. If it helps, consider giving each buyer persona a score for their levels of pain and influence. If you assigned a number between 1 and 5 for pain and influence, the highest scoring persona would be the one you want to target. At the same time, address the needs of the other members of the customer committee. If you can balance your approach and message in this way, you should be able to move the preference needle with the whole group. Understand the customer. Understand the market. Create preference. Aren’t these all basically the same activity? Yes and no. As a technology marketer, one of your most basic jobs is to understand what the customers wants and what he or she will actually buy. The two are not necessarily the same thing. What you can interest people in, and what you can sell them are often completely different products. This dichotomy is frustrating and perplexing, yet it is a fixture of B2B technology marketing. If it’s any consolation, I am pretty sure that the biggest successes in the tech industry also were muddled about the size and definition of their respective markets from time to time. In most cases, the true breakouts establish what the market is, and everyone else follows. So, just be a big success and none of this will matter. How hard could that be? Seriously, the best approach to understanding your market is to focus on what customers are going to buy from you in the near term. This is a process that does not necessarily have to align with your analyst briefings and official boilerplate. What are people buying today? What’s similar to your product, and who is selling it? Who’s buying it? That’s your market. For Kwikapp, for example, they sell a portal and image file management system. Like it or not, they have to face the fact that they have some very big competitors in their market. They’re going to be going up against Microsoft SharePoint, IBM FileNet and WebSphere Portal, EMC Documentum, and OpenText. In a market analysis we are not going to get into specific product-to-product comparisons. We need to understand the market dynamics. And, as the table below shows, segments really matter when you’re trying to figure out market dynamics. The tensions and opportunities are quite different depending on whom you are talking to about a particular technology purchasing choice. The following is meant be illustrative, not necessarily reflecting a specific reality or definitive point of view on the market. they work with Microsoft system integrator partners. Integrate with Microsoft and OpenText products. Cultivate reseller relationships with SI partners. One thing you have to figure out right away is which segments will buy your product at all. If your product is not enterprise grade, then you will not sell it into large companies no matter how good your relationships are with big system integrators. Similarly, if your product is priced for large enterprises and has features that make it costly to administer, it will not sell in medium-size business marketplace, generally speaking. In practical terms, a given market segment might have a value of zero for your specific situation. There are a couple of big assumptions built into this model. The percent of customers currently “in market” for the product is a serious one. Of course, every large enterprise in the world could buy your product, which in this case would represent a gross market size of $250 million. Wow! Yet, we all know that there are incumbents and customers that are not going to change their existing product or add a new capability in any given year. As a result, we can determine a more realistic segmented market. Then, we have to figure out how much we can actually sell given the market dynamics. Knowing that the product requires some kind of system integrator partner, we need a realistic assessment of how many deals we can do. In the table below, we estimate how many SI partners our company can realistically find, sign, and support. Then, we estimate how many deals each partner can bring in and fulfill in a given year. That brings us to segment totals. Note that the medium-sized enterprise segment looks more appealing based on the number of partners and deals it can support. Perhaps we will want to focus only on that segment. This estimation process gives us two other things to think about. One is market share. A realistic market share goal for this company would be 27%, or $13 million in revenue in a 49% market. This is much more useful number than 1% of a billion dollar market, or some such figure you might get from working the industry reports. Also, a huge factor to consider in this kind of thought process is how many deals can your organization realistically support? This is often a surprise for people who are coming into enterprise technology for the first time. The truth is, there is an upper limit to how many customer engagements a tech firm can support. You have to go through an honest appraisal of what your company’s attainable market share goals can be given those constraints. A small digression is in order. If you sell enterprise technology, you will be involved in customer support. The more complex and expensive your solution, the more intense the support demands will be. This limits your ability to scale revenue. Ideally, over time your product will become easier to support and require less support. In the near term, however, it is almost always the case that support issues limit growth for enterprise technology companies. Dominance is the other big market dynamics factor that influences market sizing exercises. If one vendor dominates a category or customer segment, that will affect your ability to penetrate that market. Your estimate of attainable market share should reflect realities of dominance. In some cases, dominance is so complete as to make the whole discussion irrelevant. How big is the market for “Information Worker Productivity Tools”? Well, it’s a big market, in the neighborhood of $20 billion! Should you care? I think not. Microsoft has well over 90% of this market. The industry is littered with the wreckage of companies that have tried to take market share away from Microsoft Office. The remainder percentage is filled with open source solutions and specialized tools. So, it’s a $20 billion market that you won’t be playing in, unless you decide to partner with Microsoft. Then, you’re in a different discussion altogether. If Kwikapp wanted to hop on board the Microsoft Office wagon, it could create some hooks into Office that would enable Office users to gain access to the Kwikapp photo portal. For example, they could create a tool bar button for PowerPoint that would show a PowerPoint users photos that were available in Kwikapp for placement in a slide deck. There a lot of PowerPoint users out there (Office has about 500,000,000 users worldwide though not all are on the 2007 or 2010 editions that have the toolbar.) In this way, it is possible leverage a market that is essentially closed. Not that it will be closed forever. Even Microsoft Office is starting to feel encroachment from various mobile and non-Microsoft alternatives. Tablets and smart phone devices appear to be chipping away at Microsoft’s dominant position. So, while I wouldn’t advise anyone trying to build a business today by taking on Office, it is illustrative to try to see who is pulling ahead. If one vendor is pulling out of the herd and moving ahead quickly, that is an important sign to watch for in understanding the dynamics of the market. The “pulling ahead” phenomenon counts for a number of reasons. On a practical level, if one product is gaining momentum in the market, it may sway potential customers to go with that product. It becomes a self-fulfilling prophecy that the one that pulls ahead takes over the market. On the level of optics, it just looks good for the product that pulls ahead. It looks as if you’re doing something right, and it lends credibility to your fund-raising efforts, whether from VCs or internal budgets. Just to confound you a bit, though, consider the effects of market mass in contrast to speed. In some cases, a single vendor will pull ahead and quickly start to dominate a category, only to be rolled back by bigger competitors later on. The classic case of this was with BEA and IBM WebSphere. BEA was an early innovator in the Java-based application server market and quickly rose to prominence. Over a period of years, though, IBM WebSphere relentlessly pushed its way into the category and is today the world’s number 1 app server. BEA was later acquired by Oracle. of the mainframe and making it work for their businesses. 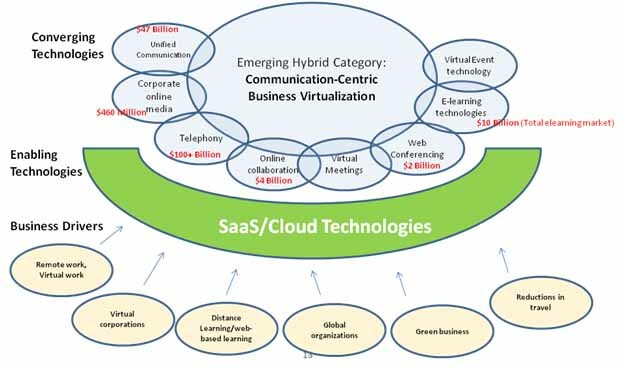 This chart is what I call an “abstractagon,” a visual crime committed in the name of helping technology entrepreneurs find clarity in their strategy. In this case, I am trying to show how the relatively small category of enterprise video fits into an evolving landscape of online communication and business virtualization. The idea was to situate the product accurately in the small category but show how enterprise video was morphing into something bigger. Business drivers such as remote work and virtual corporations, combined with trends such as distance learning and green businesses were creating opportunities for new technologies such as UCC and virtual meetings. Video was a factor in many of these new technologies, so it was possible to identify places were the small enterprise video category would grow as it merged with others. If you are confused about what market you are in, one approach is to look at the major vendors and see what they are doing, and with whom they are partnering. For example, Microsoft describes SharePoint as a collaboration tool, among other things. Their site says, “Microsoft SharePoint 2010 makes it easier for people to work together.” This tells you that the idea of collaboration tools is going to be gaining traction in the marketplace, or at least in buyer-vendor conversations. Why should you care what Microsoft is doing? Well, the reality is that a big vendor such as Microsoft is going to be heard when it talks about its product categories. When I was public relations manager for SharePoint, we got almost a thousand pieces of press coverage for the product in a single year! (It was due to my incredible genius, of course.) Seriously, big vendors get coverage and analyst attention. They get talked about. They lead the discussions about categories and trends. Let’s return to the issue of market size. The size of your market matters for a number of reasons. For one, thing, it can tell you how much of your product you can expect to sell. I was once involved in developing software that could only be used by movie studios and large media distribution companies. Not a good idea… when you only have 20 potential customers in the whole world, you’re not going to sell very much software. That market was probably about a $20 million a year. Given the number of incumbents, it was impossible to carve out any meaningful revenue for ourselves. The discussion of market size for enterprise technology products brings to mind a hilarious comment made at an SOA conference a number of years ago. The speaker said something to the effect of, “SOA is now encountering an unforeseen obstacle on its way to becoming the de-facto enterprise architectural standard: reality.” Official prognostications are great, but they are not usually very helpful for gauging how much of your product you can actually sell. Industry firms may peg your market at some level (typically very high) but that number may be totally meaningless in actual sales and marketing terms. How do research firms come up with market sizes that are not realistic? One problem stems from research firms’ tendency to correlate relatively open-ended questions with hard numerical estimates. For example, a research survey might ask IT managers what they are planning to spend on a certain category of software. The categories offered as choices may be a bit vague or aspirational, e.g. “Unified Communications and Collaboration (UCC).” One survey taker might consider UCC to include all productivity software, such as groupware and intranet software, while another might think that UCC only refers to VOIP hardware. The first person says that he will spend $10 million on UCC in the next year while the other says he will spend $50,000. Both are right, but the result can be a hugely inflated market size estimate. In this assessment, your company has a 7% share of a market that’s about $70 million. Is that good or bad? Hard to say… However, if the industry research firms peg your market at $1 billion, you will be seen as having one half of one percent of the market. Ouch! That’s tiny, so small that you might get completely written off by buyers and analysts. Yet, do you want your investors to think you’re in a puny market? How many metaphors can I mix in describing this terrible dilemma? It’s a double-edged sword, a fool’s errand, full of narrow risky straits, rocks and hard places, and catch 22s.